Posted in BI Industry, DAX, Power View, PowerPivot, SolidQ, SQL Syndication, SQLServerPedia, Tabular Models. 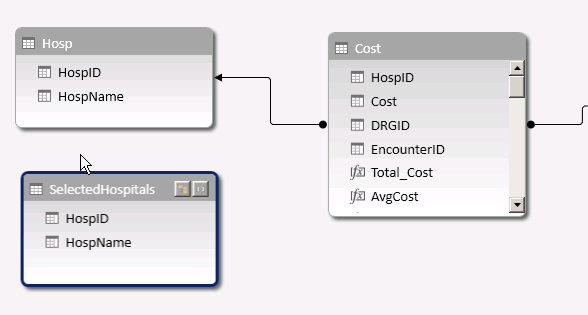 A client came to me with a challenge this week that, although simple in concept, posed an interesting challenge that I hadn’t solved before using a tabular model and DAX. 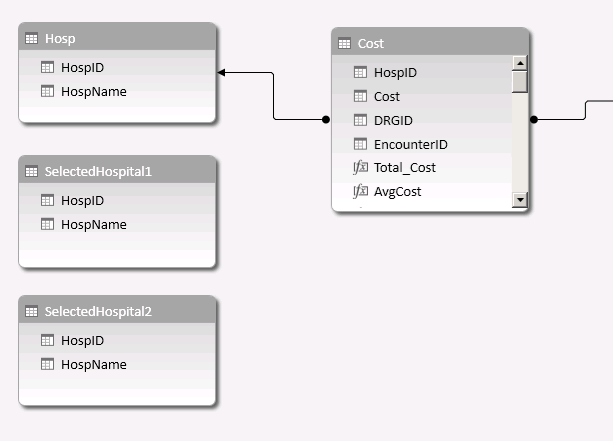 She had cost information for several hospitals in a PowerPivot model. 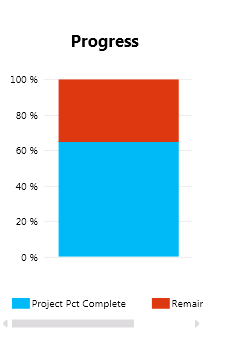 Using an Excel pivot table published to a SharePoint site, users were to select any combination of hospitals using a slicer and compare relative costs for these facilities and other measure values. After working on the problem and have two working solutions. I don’t think one is necessarily better or worse than the other but each have advantages over the other. Thanks to Rob Collie and Marco Russo for their contributions as we’ve discussed potential solutions. A fact table contains cost information and a HospitalID key, which is related to a lookup table of hospitals. 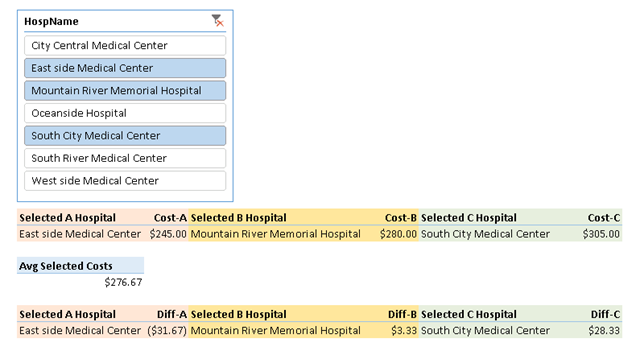 Now the challenge is to allow users to select two different hospitals and return the name and related measure values for the selected hospitals so we can perform comparisons on the same row. Later, in production, users will select 3 and maybe up to 6 hospitals for comparison. My example only shows two. My first thought was to just add the hospitals to rows in the PivotTable before the measures but they have some specific statistical calculations to perform with a group of selected hospitals that can’t be done if these are rows in a PivotTable. I added two copies of the Hospital table to the model without any relationships. These are “disconnected tables” meaning that including these in queries will have no effect on filtering data in other tables unless used explicitly in calculation. They will be used to drive slicers and filters, and used in special calculations. In an Excel PivotTable or Power View report, a slicer is created based on each of these two tables. 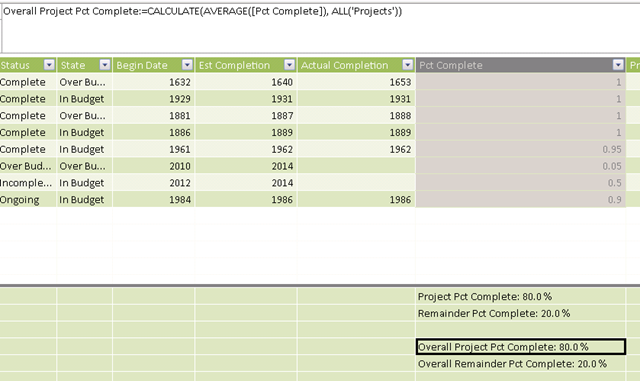 Calculated measures are added to the fact table to calculate and filter the existing Total Cost measure. Of course, similar calculated measures could be created to calculate any other measure as well. …but DAX doesn’t work that way. We think in terms of Rows and not Sets and there is no Items collection. The TOPN function needs 4 arguments: the first tells it how many rows to return (in our case only 1… the first row), the second is a table (the VALUES function turns a bunch of field values into a table), the third is the Order By expression, and the fourth argument specifies descending or ascending sort order. 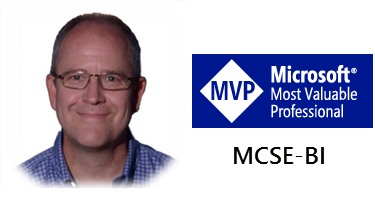 Posted in DAX, PowerPivot, SQL Syndication, SQLServerPedia, Tabular Models. Posted in BI Industry, Microsoft BI Platform, MVP Community, Power View, SQL Syndication, SQLServerPedia. I’m very excited to see my first feature article published in SQL Server Pro Magazine titled Custom Programming to Enhance SSRS Reports; How to write a custom assembly and use it to build a dynamic report dataset. The article was posted online in April and featured in the July printed and electronic edition. SQL Server Pro (formerly known as “SQL Server Magazine” or “SQLMag”) is published by Penton Media and is the largest publication for the SQL Server community. Please read the article, download the code, work through the exercise and let me know if you have comments or questions. Posted in BI Industry, Microsoft BI Platform, MVP Community, SolidQ, SQL Server Pro Magazine, SQL Syndication, SQLServerPedia, SSRS Administration, SSRS Design.